A man who was supposed to be looking after an historic site in Worcestershire has been jailed for letting cannabis be grown there. Wayne Robinson has got 14 months in prison after police found 885 plants in Drakelow tunnels after raids in 2013. The 48 year-old, of Marlpool Lane, Kidderminster, had been found guilty of permitting the production on a premises of a Class B drug following a trial earlier this year. It comes after Jason Whiley was sentenced to two-and-a-half years in prison at Hereford Crown Court in December 2015. The 42 year-old of Thorns Avenue, Brierley Hill, West Midlands, was found guilty of being concerned in the production of a Class B drug - cannabis, in October. The sentencing marks the culmination of a complex investigation conducted by West Mercia Police, which saw officers raid the tunnels in Kingsford Lane, Wolverley in 2013. 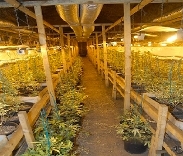 A total of 885 cannabis plants were discovered when a warrant was executed at the site in November of that year. Detective Inspector John Cashion said: "The sentencing of these two men concludes a lengthy and complex investigation into the large-scale cultivation of cannabis at one of Britain's historic locations. "It was clear that this was a sophisticated set-up, involving high-powered lamps and timers in order to provide an ideal artificial environment for the growth of cannabis for commercial purposes. "It would have cost several thousand pounds to buy the equipment which was being used. "I hope the sentences handed out by the courts leave people involved in this type of criminality in no doubt that they will be made to face the consequences of their actions. The supply of illegal drugs is a matter which West Mercia Police takes very seriously; we will work tirelessly to catch those responsible and ensure they face justice." Robinson was also sentenced to nine months in prison, having pleaded guilty to possessing ammunition for a firearm without a certificate and six months in prison for possessing a shotgun without a certificate - both relating to his home address. His sentences will all be served concurrently. He was previously found not guilty of acquiring, using or possessing criminal property, namely a JCB.